Since mortgages are funded by the bond market, I've broken it down into a two key points that impact them. Trump is uncertainty personified. Since most of the US debt is held by foreigners, Trump's shoot from the hip approach has demanded a premium in the market place. What would you rather have $1 today or $1 five years from now? If you answered five years from now, let us know where we can ship your Trump University degree. If you answered today then you understand the effect of inflation on bonds. Trump's policies are incredibly inflationary. He wants to reduce the "illegal" work force, bring back more jobs to an economy reaching full capacity AND he wants dump tons of money into the system by building infrastructure. It's like throwing a match on a pile of kindling that has finally dried out after being waterlogged for 8 years. Should we lock in for the longest possible term? No! We always recommend terms no longer than 5 years. Any longer than that and you are paying too much of an interest rate premium. Are interest rates going to go through the roof? 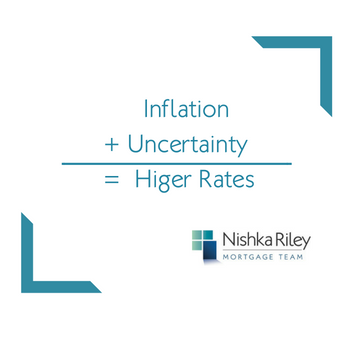 In the short term we may see more rate increases as the Federal Reserve raises rates later this week, however as mentioned in "Is it time to fix your mortgage" post, a lot of the future has been priced into the market. Given our experience our best guess is that over the next three years a rate of 3.35% for a 5 year fixed mortgage could be the high point. Should we fix our variable rate mortgage? It's complicated. You need to read the "Is it time to fix your mortgage" blog post.